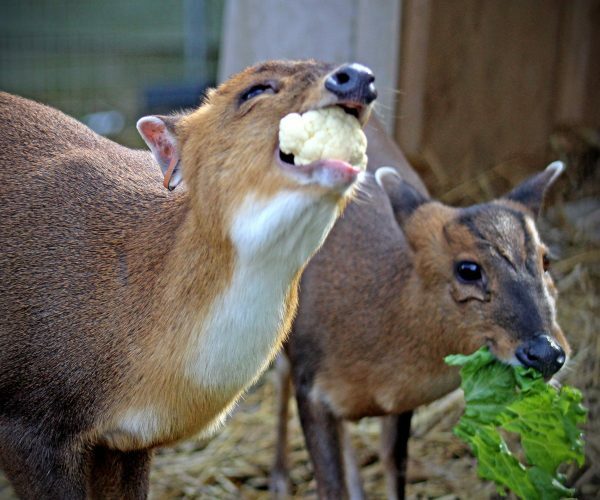 Muntjac are true deer with males having small tusk-like canine teeth reaching an inch in length and small antlers up to 3 inches long. Muntjac are active at dusk and dawn. When alarmed they can make a sharp barking sound giving them the alternate name of “barking deer”. Both sexes defend small solitary territories which that mark with pronounced preorbital glands on their face. Fawns are spotted and weigh just over a pound at birth.